We are proud to be the main sponsor for a local charity event, the ‘TourDeFootball’. 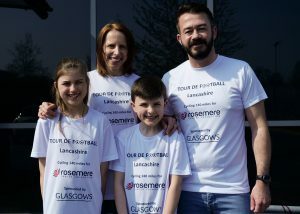 On 30 June, Kerry Crooks from Leyland will cycle 140 miles around eight Lancashire football stadiums to raise money for Rosemere Cancer Foundation. Kerry’s ride will take her to Preston North End, Blackburn Rovers F.C, Burnley F.C, Accrington Stanley, A.F.C Fylde, Blackpool F.C, Fleetwood Town F.C, Morecambe F.C before cycling back and finishing at Preston North End’s stadium. After sadly losing her father in October 2018 to a battle with Amyloidosis, Kerry wanted to give something back to Rosemere Cancer Foundation to show her appreciation for the world class care and treatment her father received whilst in their care. Here at Glasgows we have a commitment to support the local community of Leyland and surrounding areas and raise awareness of such important causes. For the event, we have provided water bottles and t-shirts for Kerry and her support riders. Rosemere Cancer Foundation is based at Royal Preston Hospital and provides care and treatment for cancer patients as well as cutting edge equipment and training for clinicians from Lancashire and South Cumbria. Andy Ray, Head of Projects said “It is great for Glasgows to be part of such a wonderful event, not only supporting Kerry and her family but also helping to raise money for a local charity that helps so many other families”.